Blue Ridge Collaborative Regional Alliance for Farmer Training (CRAFT) cultivates meaningful mentor relationships between aspiring and experienced farmers through a series of on farm peer-to-peer workshops and winter round table discussions. We believe that the educational and professional development of tomorrow’s growers and producers informs the health of our diverse local-food system and rural economy. The CRAFT website has internship listings for the High Country and workshops for farmer training. 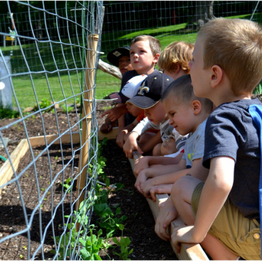 The High Country Community of Gardens is a network of community, service agency, church, and K-8 school gardens that work together to grow food for low-income families in the High Country and to inspire and educate our youth to grow food for themselves and their families. Many of the gardens are part of the Lettuce Learn Program . Several of the gardens offer plots to low-income families, encouraging them to grow their own food, while others donate the produce they grow to local food banks and the F.A.R.M. (Feeding All Regardless of Means) Cafe. All of the gardens are sustained by a strong network of volunteers, small grants, donations, and resource sharing. Doubles the value of federal nutrition (SNAP/EBT or food stamps) benefits spent at participating markets, helping people bring home more healthy fruits and vegetables while supporting local farmers. The win-wins are three-fold: Low-Income Consumers have access to more healthy, locally produced food; Local Farmers gain new customers thus making more money; and the Local Economy benefits because more food dollars stay in the local community. With your help, BRWIA is working to expand this program so that more families can gain access to locally grown produce. By managing both the Winter and King Street Weekday Markets, we provide additional markets for local foods and artisan goods. This allows consumers more opportunities to support their neighbors and consume more locally source goods and also provides producers with additional outlets to earn a livable wage. Profiling our region's incredible women in Agriculture. These women are diverse: coming from a variety of backgrounds and including farmers, homesteaders, and activists. They exemplify the multitude of ways women are working to connect with and change our food system. BRWIA works with a variety of organizations to provide funding for innovative and sustainable agriculture projects. Grant programs include the Mary Boyer Sustainable Food & Agriculture Grant for female farmers, the Heifer USA funded Direct to Farmer Grant, and the High Country Local First Farm-to-School Grant. Scholarships for conferences and travel are also available for female farmers. Helping to strengthen our local food system by connecting producers and consumers, educating the public about sustainable food and agriculture, and providing farmers with opportunities to increase their income. BRWIA recognizes that the health of our food system depends upon community support and consumer education. We believe that by providing community members with opportunities to visit local farms, connect with farmers, and learn more about growing food sustainably, we can create an educated consumer base that supports and advocates for locally-owned and operated farms and businesses. The High Country Food Hub is a central storage facility for locally-grown food located at 252 Poplar Grove Rd in Boone. Blue Ridge Women in Agriculture and the Watauga County Cooperative Extension worked together to create this space which opens new markets for our community’s farmers and serve as a collection site for vegetables grown in community gardens to then be distributed to local food banks. The Food Hub features an online local foods market where shoppers can purchase locally produced food and artisan goods. We partner with local experts to present seasonal educational workshops that promote sustainable living and self-sufficiency. These workshops are meant to serve as educational tools to raise awareness for our local food system. We know that healthy food systems depend upon community support so we provide opportunities for people outside of the farming community to learn about local agriculture. Community workshops, events, and meetings are designed to reawaken the High Country's appreciation for the local food system. Supporting teachers, child care professionals, and school leaders to create edible landscapes for learning, by providing help where they need it most: staff, training, and resources. We strive to create impactful educational opportunities that engage children with their natural world, enable them to make healthy choices, and encourage them to help build sustainable communities. Housed in repurposed card catalogs, the Ashe and Watauga County Seed Libraries offer free, open-pollinated seeds to community members who can take seed packets, grow and enjoy fresh vegetables from their gardens. Patrons are also welcome to then save seeds from those plants, returning the seeds to the Seed Library.